Usain Bolt is a Jamaican athlete, track athlete, sprinter. He is considered to be the fastest person on the planet. Usain is the eight-time Olympic Campion and 11-time World Champion, which is the highest achievement in the history of these competitions. Bolt has set world records in all distances where he participated and holds the record in the 100 and 200 meters. Usain Bolt has earned the nickname "Lightning Bolt." Usain was born and raised in Jamaica, in the small town of Sherwood Content. Father Wellesley Bolt ran the grocery store, and mother Jennifer was a housewife and raised three children. They also had the eldest daughter, Sherine, and the youngest son, Sadiki. As a child, Bolt did not think about anything other than sports. Before age 10, the boy entirely focused on football and cricket, but instead of the ball boys used orange in the yard. 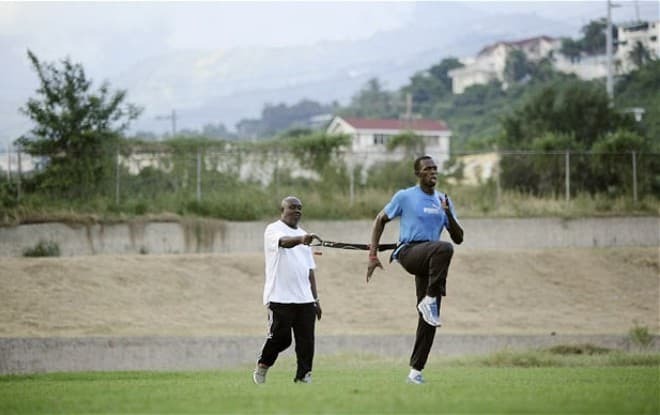 Upon his entry to William Knibb Memorial High School, a coach urged Usain to try track and field event. He paid attention to the boy’s speed on the pitch and persuaded him to give up cricket and focus on running. At the age of 12, the boy was already a district champion and took the silver medal in the 200 meters at the High School Championships. Usain Bolt already showed excellent skills at children's, youth and junior competitions. Before age 18, the athlete already had many significant victories on the world stage and set world records in his age group. At the world championships, Usain won his first medal in 2007. It was in Osaka, Japan. Bolt won a silver medal in the 200 meters and the team relay. These were the last competitions where Usain was not the winner. Subsequently, Usain won the World Championship 11 times and became Olympic Champion 8 times. Usain was stripped of the ninth gold medal, which he won in the 4 × 100 metres relay at the Beijing Olympics after a blood sample, taken from Nesta Carter, was tested positive for a banned substance. Jamaican Michael Frater and Asafa Powell were also stripped of gold medals. Usain Bolt continually improves his results and beats world and Olympic records, remaining the fastest sportsman in the world. 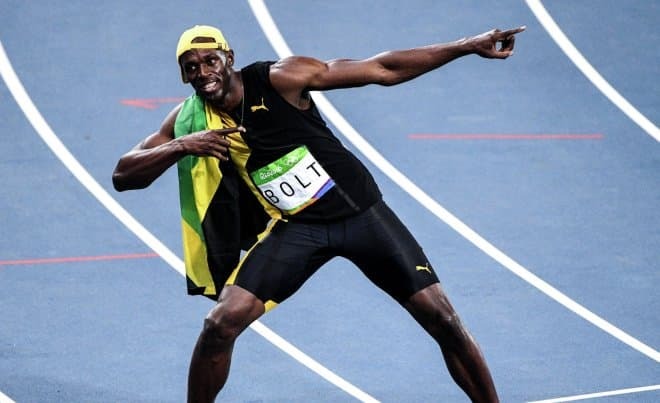 Doctors studied a phenomenon called Usain Bolt and concluded that the reason for the fantastic records is the genetics of the athlete. One-third of Bolt's muscles consists of super-fast muscle cells, which allow him to be at least 30 years ahead of the standard athlete. Besides, the beautiful physical fitness, the height of 195 cm and the weight of 94 kg help the athlete achieve impressive results. Usain Bolt’s average step length during the race is 2,6 meters, and the peak speed is 43.9 km per hour. It is hard to imagine that nowadays anyone can compete seriously with the Jamaican, even though Bolt’s speed on the pitch is below the average. Usain announced that the 2016 Olympics in Rio de Janeiro, Brazil, would be the last in his career. Before the competition, Bolt got injured. The performance was in jeopardy, but Dr. Hans-Wilhelm Müller-Wohlfahrt, who works with the German national football team, helped to recover before the first competition in the 100 meters. Within a few days, the doctor decreased the pain syndrome and healed the injured muscles of the athlete. As a token of gratitude, Usain presented Müller-Wohlfahrt golden shoes, with which he broke the record in 2009. The sprinter wanted to set a new world record in the 200 meters, but it did not happen. The Jamaican athlete won the Olympic gold medal in Rio, but could not beat his own record. Nevertheless, his unique sports biography has already made it into history. Usain Bolt was not married, but he has had a lot of relationships. 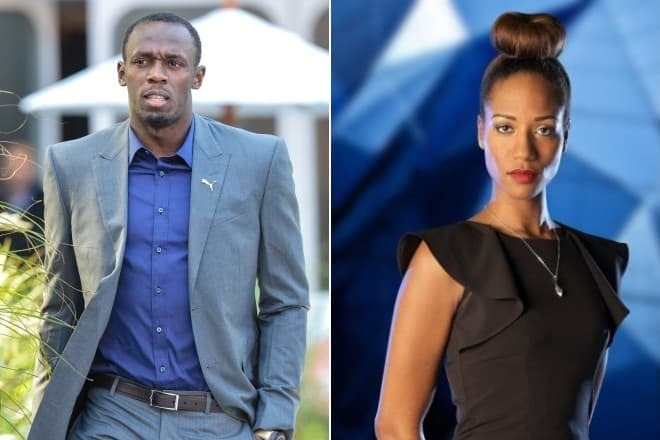 The sportsman dated economist Mizicann Evans, TV presenter Taneish Simpson, British model Rebecca Paisley, fashion designer Lubica Slovak, English athlete Megan Edwards. He has recently had a love affair was with compatriot April Jackson, who is a famous model in the homeland. In late 2009, Usain Bolt traveled to Kenya and during this voyage adopted a three-month cheetah, whose parents were killed by poachers. The Jamaican athlete bought the "kitten," and named it Lightning. 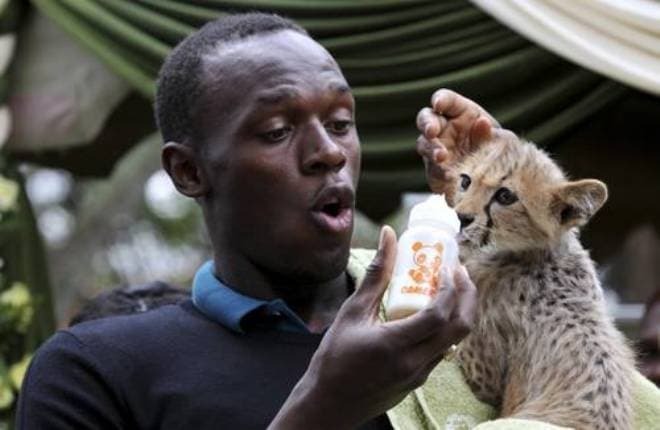 Each year, the athlete pays to care for Lighting Bolt, who will be raised at an animal orphanage in Nairobi. Nowadays Usain Bolt lives in the capital of Jamaica, Kingston, and trains on the stadium of the University of the West Indies. The sprinter is considered the highest paid athlete in the world. The prize money is not the central part of the annual income since he earns money for advertising and sponsorship contracts. The sprinter’s restaurant called Tracks & Records in Kingston brings income too. Usain has a lot of cars, including three Ferrari, the total cost of which is $ 600 thousand, as well as an everyday car BMW M3. An interesting fact is that the driver prefers to be barefoot while driving. Bolt still loves cricket and football and prefers the English Premier League. He is a fan of Manchester United. Usain pays a lot of attention to the results of his favorite team. In 2009, the sprinter told about shortcomings of Cristiano Ronaldo’s play. He is the best player of the Red Devils. After a while, the runner and the football player met to share best practices. According to Usain, Ronaldo needed to maintain the upright position of the body while running, which would prevent a footballer from falls. According to the athlete, after joint training, Cristiano began to score 40 goals a year. 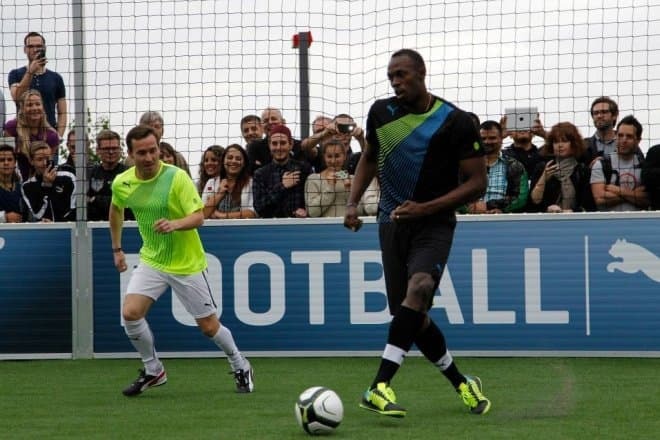 Usain Bolt claims that he could play for this team since his speed would help downplay the lack of football technique. The athlete even took part in the training of a football club. He soon posted a photo on his Instagram account wearing the form of South African club Mamelodi Sundowns. In 2017, Usain Bolt announced the end of his professional career. However, Bolt does not intend to retire. He has repeatedly told about his love for football and decided to make his dream come true. Initially, the sprinter negotiated with Borussia Dortmund, then conducted a series of training sessions with the South African club Mamelodi Sundowns. 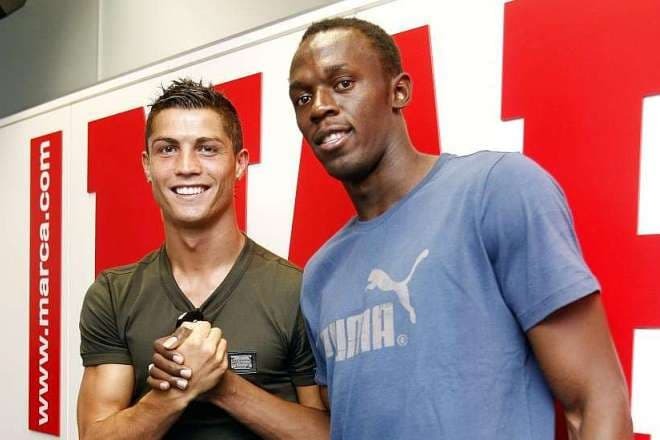 There were even rumors that Bolt had signed a contract with a football club. But the athlete did not specify the name. However, Usain has still not achieved his cherished dream, the information about the contract turned out to be speculation. In early 2018, Usain Bolt announced his participation in the charity soccer Aid match for UNICEF. It will be held at Old Trafford on June 10. Teams will consist of sports and show business stars. Singer Robbie Williams will play for the rival team. 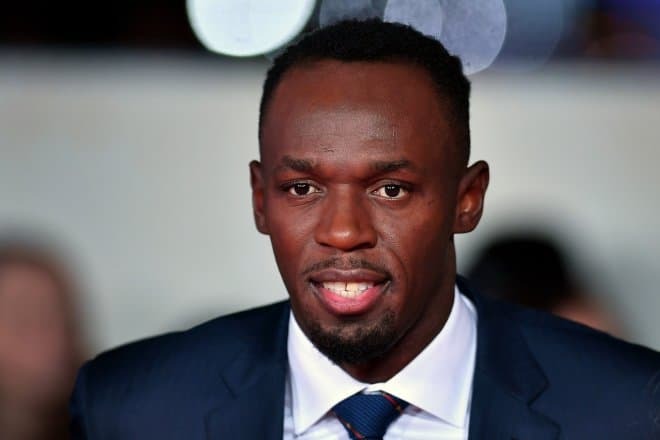 Although it will be the amateur competition, Usain Bolt is satisfied with the opportunity to play on the football field of his favorite club, which he proves with positive posts on Twitter and Instagram.